A dozen eggs stored in the fridge is the most convenient of protein foods, always on hand for a quick omelette, frittata or simple supper of scrambled eggs on toast. 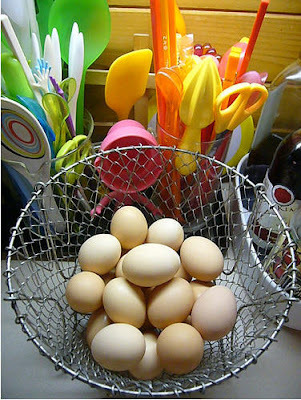 Eggs appeal to all ages from babies to older folk who find them soft and easy to digest. Unfortunately, the good name of the egg has been marred since the '70s, when its cholesterol content gained it a reputation as a trigger for heart disease. Eggs are incredibly nutritious. They supply every vitamin except vitamin C, as well as a number of key minerals, including selenium, iron and zinc, which are vital for a healthy immune system. They are a good source of lutein and zeaxanthin, antioxidants that may prevent the loss of eyesight with age. Two medium eggs provide about 13g protein, 10g fat (of which only 3g is saturated), 375mg cholesterol and no carbohydrate or fibre. With carb diets all the rage these days, it makes one wonder about the health dangers of too much cholesterol in the diet. Eggs are one of the top offenders when it comes to cholesterol with the USDA recommending that individuals consume not more than one egg per day, and this includes any egg that has been inserted into the recipes we consume throughout the day - eggs that may be hidden.